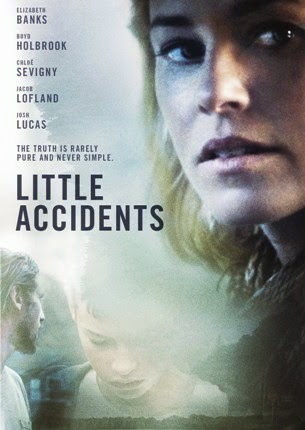 Anchor Bay Entertainment and Amplify Releasing recently send us over information for the upcoming DVD release of "Little Accidents". The film is a festival favorite at Sundance and MIFF, a winner at the Hamptons International Film Festival and Napa Valley Film Festival, and 2015 Independent Spirit Award nominee. "Little Accidents" stars Elizabeth Banks (The Hunger Games trilogy, “30 Rock”), Josh Lucas ("The Mysteries of Laura”, J. Edgar), and Boyd Holbrook (The Host). "Little Accidents" hits DVD on April 21st. A town is reeling from a fatal mining accident. How much more can its shattered occupants take? On April 21st, Anchor Bay Entertainment and Amplify Releasing will release LITTLE ACCIDENTS, a story of what happens when battered truths and tangled emotions are the only bonds that hold a grieving populace together. A festival favorite at Sundance and MIFF, a winner at the Hamptons International Film Festival and Napa Valley Film Festival, and 2015 Independent Spirit Award nominee, LITTLE ACCIDENTS will be available on DVD for an SRP of $22.98. A tragic mining accident has left a small town stunned and unwilling to cope with its aftermath. But when a teenage boy goes missing, three strangers find themselves drawn caught in a web of secrets and lies: feeding off the collective grief of the community. Diane (Elizabeth Banks, The Hunger Games trilogy, “30 Rock”) is desperate to find her son, yet at the same time is losing touch with her husband (Josh Lucas, “The Mysteries of Laura”, J. Edgar), a mining company executive whose role in the accident has made her family the prime target for the town’s anger. Then, when a union of tormented affection forms between Diane and the sole survivor of the disaster (Boyd Holbrook, “Behind the Candelabra”, The Host), revelations will be uncovered that threaten to tear open the wounds of a town that is just beginning its own tormented healing process. Through Emmy™-winning cinematographer Rachel Morrison’s lens, LITTLE ACCIDENTS captures scenes of desolate beauty: the isolated loveliness of a small town in West Virginia. First-time director Sara Colangelo won at the Hamptons International Film Festival for this evocative story – an intuitive vision of grief at its deepest roots. Complex yet subtle, it is a testament that the “little accidents” can either destroy…or mend.